Recently I’ve noticed that some restaurants are playing word games. 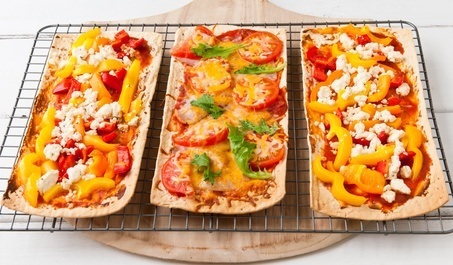 Instead of offering “pizza,” they’re offering “flatbreads,” even though the two are virtually indistinguishable. But it does change customers’ perceptions. Pizza is an inexpensive food for Friday nights. But stone-fired artisan flatbread… that sounds fancy, and possibly worth paying a little extra for. Based on early responses, I thought “conversion optimization expert” was going to be the runaway winner, but I was wrong. Direct response copywriter took 55.56% of the votes (25 out of 45). The comments were the most interesting part. Most people seemed to think that the work direct response copywriters do is more difficult than what COEs do. Starting from scratch? Direct response copywriter. But if I’m hiring someone to improve an existing website, probably going with conversion optimization expert. A few people mentioned the ideal blend of a direct response copywriter with conversion optimization skills. Another person said he would never hire a COE who didn’t already have copywriting skills. Respondents viewed conversion optimization experts as having a limited skill set and direct response copywriters as more versatile because they can be effective in both online and off-line environments. Anyway, the labels we use have a direct impact on our customers’ and clients’ perceptions. Choose the wrong label and you’ll be fighting against negative perceptions. But choose the right label and you’ll have the wind at your back because you’ll be working with positive perceptions. When I shared these observations in a private forum, a few people chimed in with their own personal stories and experiments. Want to improve your sales results? Pay attention to the labels and words you use. They’re important. P.S. I’m available on a limited basis for high quality copywriting projects. You can tell me about your project here.